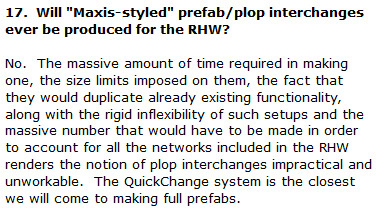 From the release of the initial details of the RHW's "Modular Interchange System", or MIS, back in 2006, the mod's developers have been adamant about adhering to a strictly modular approach to interchange construction, with the intent of the RHW providing a much cleaner and readily expandable solution to make custom interchanges, when compared to the awkward Maxis Highway/One-Way Road hybrids at the time. This of course, begs the question: what changed? The big change has been the NAM's hard shift away from non-overridable/"static" items--the traditional puzzle pieces that had been the centerpiece of NAM development from its early days. In their place, more draggable items and FLEX Pieces (which initially look like puzzle pieces, but behave like draggable items, by being capable of morphing into new setups, based on the networks fed into them). The advantages of going FLEX are myriad. The components that make up the interchange are existing modular pieces, and aside from making the preview model, the setup can be built using what is known as "RUL0 code" (an SC4-specific scripting format), rather than having to piece together an entire setup with new path files, exemplars, and Instance IDs. 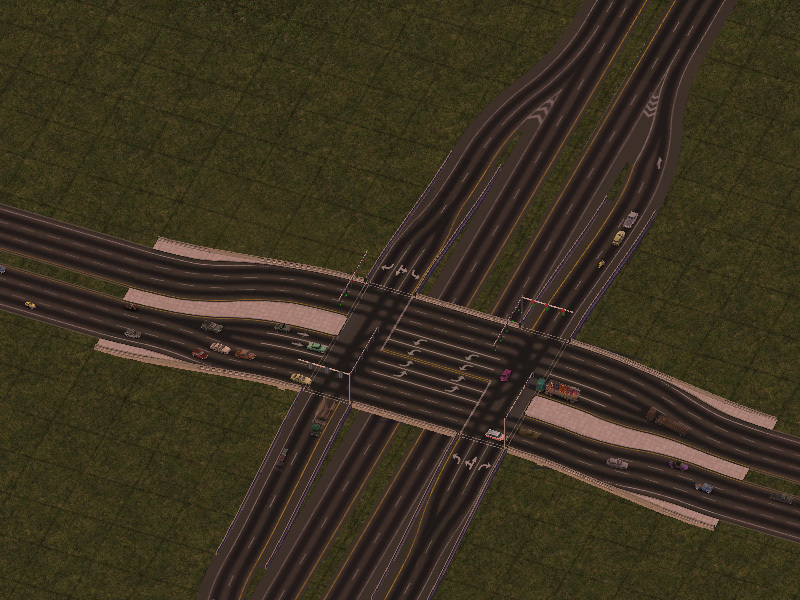 Additionally, unlike the traditional static setup used with the Maxis Highways, these FLEX-based interchanges can be modified on the fly, accepting overrides such that a single interchange can be used with multiple networks. Using a static approach, we would have to create a piece for each interchange setup for each network, and if one needed to widen their highway, or alter the design in anyway (i.e. adding an exit-only lane), it would require a complete bulldoze. That's not the case a FLEX-based design. While the 2016 prototype is a very basic setup, the more recent example shown includes turn lanes, on both the surface network and the approaching ramp. The goal with this is to not only increase the realism of these pre-fab setups, but also to make what would be a very complex build (combining various modular RHW items and the FLEX Turn Lanes system), into something that literally takes just one click, and will be of interest to RHW users of all skill levels. In short, the RHW system is, at long last, on the verge of becoming a much friendlier NAM component to use, by opening up its range of realistic interchange solutions to a wider audience of SC4 players. While the initial designs shown here are conventional diamond interchanges, more setups--including highway-to-highway interchanges--are in the planning stages. The NAM Team famously does not give out release dates, or timelines for release (the one time we did--NAM 31 in 2013--was a disaster), but look for the initial set of QuickChange Xpress interchanges to make their public debut sometime within the next couple of release cycles. 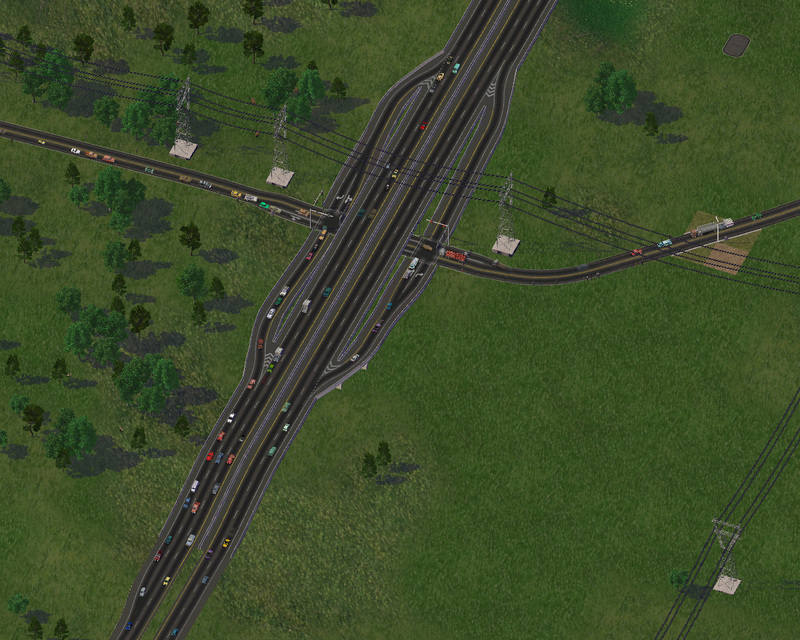 The Network Addon Mod, or NAM, is a modification for SimCity 4 Deluxe (or SimCity 4 with the Rush Hour Expansion pack), which adds a myriad of new transport network items, ranging from ground light rail, to fractional-angle roads, to roundabouts, and much more. It also includes bugfixes to Maxis items and a highly optimized set of traffic simulator plugins, improving pathfinding accuracy and performance. Started in 2004, the project still maintains a small but active development and support team, looking to expand the capabilities of Maxis' classic city simulator even more. Sneak peek at the next evolution in SC4 turn lanes. This is a fix for a problem the SimCity 4 BAT textures which primarily occured with larger buildings. Não há versões recentes para o Sim City??! Simcity 4 is even better with the NAM mod! im trying to download NAM onto a computer that doesn't have internet.... how m,ight I do this? USB??? yeah, ive always played this for years like almost everyday - addicted! I need to contact an admin and have him add a page for Cities XL so that a simtropolis user(globexco) can upload a mod that is a bit big for the wimpy servers of simtropolis. I hope another city building game comes out which is as good, or better than Sim City 4. Cities XL and Societies were complete failures. Our servers will be going down for maintenance at 10AM PT. We will provide an update when they are back online. Thank you for your patience!